When I advocate family adventuring, I mean outdoor adventure involving nature. What a surprise it was to apply our outdoor adventuring to an urban setting and find that we all really liked it. Of course it wasn’t just any city, but Vancouver during the Olympics. Backpack of snacks, clothing layers, and water (just as we’d take hiking) – check. Sense of readiness to play I-Spy-Something-New – check. Willingness to walk many miles – check. Not many trees did we see, but it was inspiring people-watching. We saw a couple women in Netherlands team jackets, whole families faces painted and dressed in Canadian flags, a juggler in checkerboard pants. 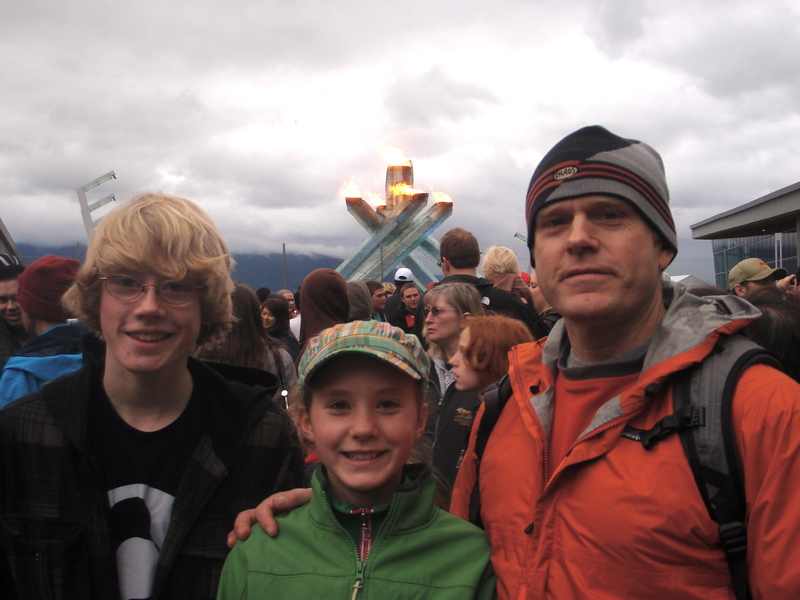 We smelled the Olympic cauldron burning, heard spontaneous renditions of the Canadian anthem, felt the chill emanating from the Robson Square outdoor ice rink. While driving to and from the SkyTrain (public transportation into the city core), the kids noticed the purely Canadian species they’d been exposed to while watching the Olympics on a Canadian television channel, like Tim Horton’s. We didn’t stop there, but we did at Petro Canada to buy some commemorative Olympic glasses. Now we can drink orange juice in glasses adorned with the Olympic inukshuk, and remember how great it was to have the Olympics next door. Oh wait, they aren’t over yet. We’re ready to get tickets to some Paraolympic events. How could we not want to cheer sledge hockey players, and Paraolympic skiers?